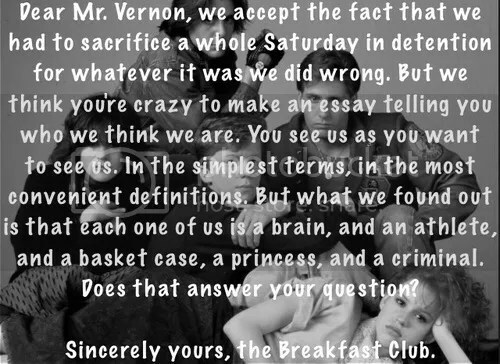 No I am not in your Saturday detention, but I am writing in response to your assignment: Who do I think I am? I don’t know how I can exactly answer this satisfactory for your high standards? My words will not be of consequence in 5 years, except only as a journal entry, marking my evolution in growth. But I do think it is an excellent thought provoking question that will make me stop, breathe deeply, and take stock of where I have came from, where I am now, and decide if where I am headed is where I need to go. I don’t write this for you, I write this for myself. What I am- is a work in progress. I am, in what I like to believe, constantly always in motion toward self-improvement. Who I was in 1985 is so different than the me I was in 1995. 2005 I was even more contrasting in personality than previous decades, and so far in 2016 I am unlike anything I have ever previously been or will become. I am one of the lucky ones who has had her inner light stoked and frenzied by those who have touched my life and set it afire. I have become cognizant and aware of my growing luminescence so much that I note the differences so acutely of those around me who are sadly fading out in loagy weaknesses like that of dying stars. It is said that when a star is born, atoms of light elements are squeezed under enough pressure for their nuclei to undergo fusion. All stars are the result of a balance of forces. That Mr Vernon is what I am- a balance of forces. It is exactly hitting on ‘that’ and the support that I’ve found here! Or as I’ve been asking- Has it really found me? !